The U.S. Consumer Product Safety Commission has announced a recall of 24,000 PowerLock bicycle chain connectors. These parts were sold individually and as a part of completed bicycle chains. PowerLock connectors were installed on higher-end bicycles like Guru, Surly, Salsa, BMC, Serotta, Seven and Ridley brands. The recall was done because the PowerLock connectors were brittle and could crack, cause the chain to disconnect, and the rider to fall. There are 4 reported incidents worldwide. The potentially defective PowerLock connectors were sold between April and August of 2009. 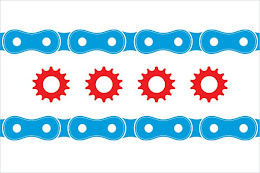 Chicago's SRAM, Inc. is generally considered to be an excellent manufacturer of bicycle equipment. The fact that one of its parts may be defective illustrates an important point: no matter who makes the bike or component, it is part of a machine, and machines can break due to poor maintenance, inadequate design, or faulty manufacturing. Because of this, Illinois law provides a recourse to those injured by defective bikes through a case based on product liability.